Pensacola Beach is an unincorporated community located on Santa Rosa Island, a barrier island, in Escambia County, Florida, United States. On the 19th (Mon), take in the waterfront at Pensacola Beach Gulf Pier, then kick back and relax at Pensacola Beach, and then steep yourself in history at Fort Pickens Area. Get ready for a full day of sightseeing on the 20th (Tue): look for gifts at Salt Water Cottage and then tour the pleasant surroundings at Navarre Beach. To find where to stay, traveler tips, photos, and other tourist information, read Pensacola Beach trip itinerary maker website . Sanford to Pensacola Beach is an approximately 5.5-hour combination of taxi, flight, and bus. You can also drive; or do a combination of train, bus, and taxi. You'll gain 1 hour traveling from Sanford to Pensacola Beach due to the time zone difference. Plan for slightly colder temperatures traveling from Sanford in November, with highs in Pensacola Beach at 72°F and lows at 52°F. Wrap up your sightseeing on the 21st (Wed) to allow time to travel to Jefferson. Jefferson is a historic city in Marion County in northeastern Texas, United States. Start off your visit on the 21st (Wed): immerse yourself in nature at Caddo Lake State Park, see the interesting displays at Jefferson Historical Museum, and then see a world frozen in time at The Grove. To see photos, ratings, more things to do, and other tourist information, use the Jefferson online tour planner . Use the Route module to find suitable travel options from Pensacola Beach to Jefferson. Plan for little chillier temperatures traveling from Pensacola Beach in November, with highs in Jefferson at 66°F and lows at 44°F. Wrap up your sightseeing on the 22nd (Thu) early enough to travel to Sherman. Sherman is a city in and the county seat of Grayson County, Texas, United States. On the 22nd (Thu), admire nature's wide array of creatures at Frank Buck Zoo, examine the collection at Courthouse-on-the-Square Museum, and then immerse yourself in nature at Ray Roberts Lake State Park. Inspirock's itinerary builder makes planning a Sherman trip simple and quick. Drive from Jefferson to Sherman in 3 hours. In November, daily temperatures in Sherman can reach 65°F, while at night they dip to 46°F. Wrap up your sightseeing by early afternoon on the 23rd (Fri) to allow time for travel to New Orleans. On the 24th (Sat), get to know the fascinating history of Jackson Square and then learn about all things military at The National WWII Museum. 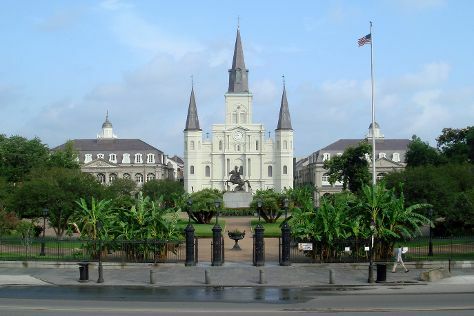 For where to stay, more things to do, reviews, and tourist information, refer to the New Orleans trip planner. The Route module can help you plan travel from Sherman to New Orleans. Traveling from Sherman in November, you can expect nighttime temperatures to be a bit warmer in New Orleans, with lows of 61°F. Finish up your sightseeing early on the 24th (Sat) so you can travel back home.